proposed linear park at Canonchet Farm. View the February 24 presentation about Shadow Farm on YouTube. Please join us for the eighth season of the winter speaker series On Pettaquamscutt: Presentations on the Environment and the History of the Narrow River Watershed. This year we feature three historic farms in the watershed: Canonchet Farm in Narragansett, Casey Farm in Saunderstown and Shadow Farm in Wakefield. 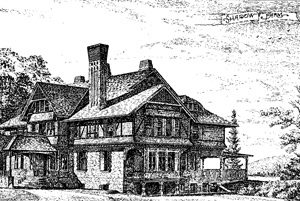 Learn more about their history, preservation and plans. The series is presented by Friends of Canonchet Farm, Narrow River Preservation Association, South County Museum and the Maury Loontjens Memorial Library with generous support from Trio Restaurant. The presentations are on three Sunday afternoons, from 1:00 to 3:00, at the Maury Loontjens Memorial Library, 35 Kingstown Road, Narragansett. All events are FREE and open to the public. After each talk, continue the conversation next door at Trio Restaurant, 15 Kingstown Road. See speakers and presentations in the first seven seasons. Space is limited for each presentation, so we encourage you to register here or at Maury Loontjens Memorial Library to reserve a seat, when online registration opens at the beginning of the month of the presentation. The Friends of Canonchet Farm is funding design of a linear park along the two coastal ponds across from Narragansett Town Beach. Landscape Architect Randy Collins of Beta Group presented the plans for an inviting and sustainable landscape in the heart of Narragansett. View Randy Collins PowerPoint presentation. Resident and local historian David Chidakel traced the ownership of Shadow Farm from the Colonial times of the Robinsons and Hazards to its development as a condominium project in the 1980s. For more views and information visit HistoricNewEngland.org. Silas Casey's Farm sits on a 300-acre plot laid out as part of the Namcook Purchase in 1659, extending across Boston Neck from Narrow River to Narragansett Bay. 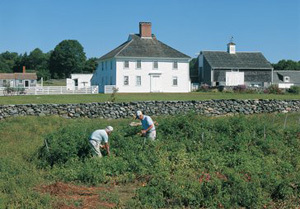 In "Waves of Blue, Waves of Green: The Southern R.I. Farms of Historic New England," Jane Hennedy, Southern Rhode Island Site Manager at Historic New England, will trace centuries of changes to the land and compare Casey Farm to its sister, Watson Farm across the West Passage in Jamestown. Their shared mission of historic preservation, landscape conservation, producing local food, and innovative educational programs comes through when following the seasonal rhythms of the farms in pictures and stories.